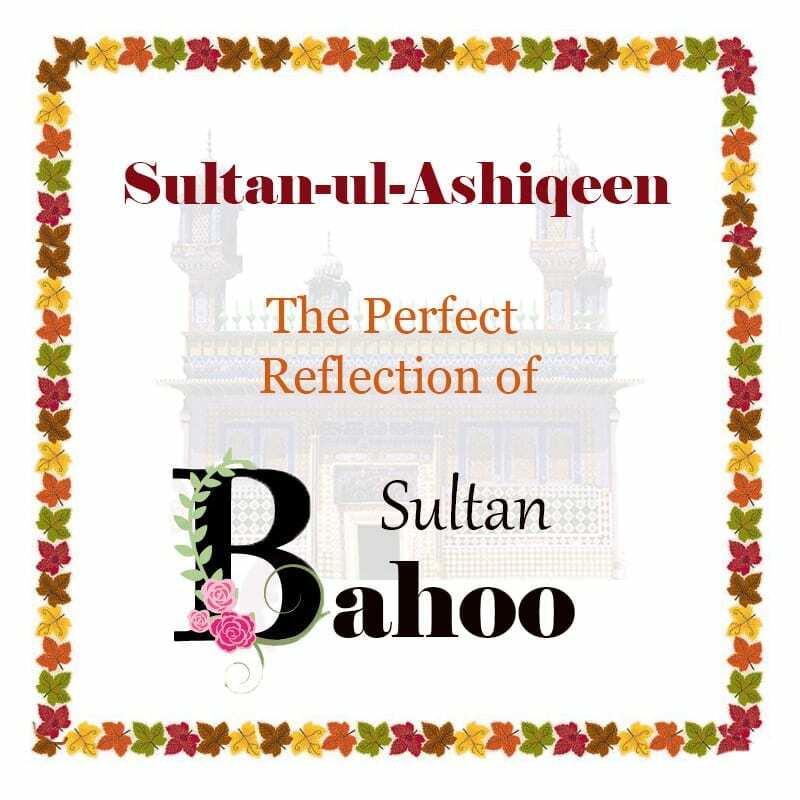 To write about the personality of Sultan Bahoo in a short article, furthermore to relate him with the present leader (imam) of his spiritual chain is a very tough undertaking. Yet the pen dared. Sultan Bahoo toiled all his life to make Faqr common like an independent Fakir. Specifically, an independent Fakir is one who travels place after place to distribute the blessing of Faqr. Sultan-ul-Ashiqeen Sultan Mohammad Najib-ur-Rehman is doing splendidly to proceed with the work of Sultan Bahoo. For this he has used every possible medium of age to spread the teachings of Sultan Bahoo round the globe. In the second place, he has travelled throughout Pakistan to distribute the beneficence of Ism-e-Allah Zaat. What not to say about spiritual blessings? I must say with Ism-e-Allah Zaat Sultan Mohammad Najib-ur-Rehman has blessed disciples with the blessing of Ism-e-Mohammad. He has unveiled on his disciples Waham (spiritual conversation with Allah), Ilham (inspiration), Ilm-e-Dawat (communication with the sacred souls of shrines) etc. I wished to write a comparison of their exuberantly impressive personality. Unfortunately, no picture of Sultan Bahoo is available. I, his servant, can only imagine him in the physical being of Sultan-ul-Ashiqeen Sultan Mohammad Najib-ur-Rehman. What makes one noble in Sufism? As far as genealogy is concerned, father of all is Adam and mother is Eve. No one has superiority, preference and supremacy on another. “O people, listen to me in earnest, worship God. Listen carefully, all mankind is from Adam and Eve, an Arab has no superiority over a non-Arab nor a non-Arab has any superiority over an Arab; also a white has no superiority over a black nor does a black has any superiority over white except by piety (a man of Faqr). Hence, all men are equal genealogically but yes if someone has superiority then it is because of his excellence in piety. In addition, if one has both, genealogy and excellence, then it adds to merit. Meaning: The one who walks my path (Faqr) is my follower. The excellence of Sultan-ul-Ashiqeen Sultan Mohammad Najib-ur-Rehman is ‘Faqr’ which is the pride of the Prophet as well as his rare legacy. It is the best of all the blessings, a great virtue, eminence and nobility. In truth, Sultan-ul-Ashiqeen Sultan Mohammad Najib-ur-Rehman did not achieve in Faqr on the basis of lineage or genealogy rather due to his hard work, sincerity and ardent love for Allah, the Prophet and his spiritual guide Sultan-ul-Faqr VI Sultan Mohammad Asghar Ali. When Sultan Mohammad Najib-ur-Rehman reached the age of thirty-six he was already tired of world. His inward desired and sought the Divine Essence. Therefore, he would spend most of his time in worships. Consequently, he presented these worships esoterically to Fatimah bint Mohammad, Hasan ibn Ali and Husayn ibn Ali. As he would seek the Prophet’s help through his beloveds. Then, on the night of 12th April, 1997 the esoteric doors were opened on Sultan Mohammad Najib-ur-Rehman at the time when he was offering tahajjud prayer. He found himself in al-Masjid an-Nabawi in the Mohammadan Assembly. The Prophet was present with the People of the Cloak (Ahl al-bayt) and the Rashidun Caliphs. Sultan Mohammad Najib-ur-Rehman pledged oath (al-bayah) on the hands of Prophet Mohammad. The Prophet entrusted him to Shaikh Abdul Qadir Jilani whose beneficence enriched him. Then he instructed Sultan Mohammad Najib-ur-Rehman to guide humanity. In Faqr, pledging oath to a living Saint is compulsory despite the fact that one has pledged spiritually on the hands of the Prophet and also been esoterically trained by Shaikh Abdul Qadir Jilani. Sayyid Bahadur Ali Shah had got the treasure of Faqr during his forty years stay at the shrine of Sultan Bahoo. As a result, he excelled in all kinds of esoteric intellects. Afterwards, he was ordered to pledge oath on the hands of Pir Abdul Ghafoor Shah. Those great personalities who had to accede the throne of Divine guidance and persuasion for them to pledge oath to a living Saint is compulsory. In Faqr, the Sarwari Qadri chain ultimately reaches the Prophet. If the chain had been broken at any point it would have led to a great turmoil. In this age of deception where people claim to be a Prophet or Imam Mehdi, can even claim to have benefitted directly from the Prophet and would have refused a need to pledge oath. Sultan-ul-Ashiqeen Sultan Mohammad Najib-ur-Rehman started the search of the spiritual guide to pledge oath to, after permission from Shaikh Abdul Qadri Jilani. Yet he could not find a guide who could take him to the extremities of Faqr. Then fate favoured him. He reached the court of bearer of Divine Trust of the age, Sultan-ul-Faqr VI Sultan Mohammad Asghar Ali. His guide tested him both exoterically and esoterically for three year. In short, Sultan Mohammad Najib-ur-Rehman proved true to his demand to only seek the Divine Essence. Then in front of the tomb of the Prophet his guide entrusted him Divine Trust on 21st March, 2001 after permission from the Holy Prophet. A simple definition of Divine Trust or Divine Trust of Faqr is the next spiritual guide of Sarwari Qadri order. Sultan-ul-Ashiqeen Sultan Mohammad Najib-ur-Rehman is spreading the bounties of this Trust day and night among the people. The world is enlightening from the rays which shines bright from his sacred personality. Sultan-ul-Ashiqeen Sultan Mohammad Najib-ur-Rehman is an independent Fakir like Sultan Bahoo who distributes the bounties of Ism-e-Allah Zaat (the Divine name which leads to the Essence) by travelling among mankind. Sultan Bahoo traveled immensely to persuade people to opt the way of Faqr and gnosis. Hence, he spread Faqr among villagers and these were the people who proceeded his work. Sultan Bahoo had spent his entire life to search for seekers of Allah and make them One with Him. Consequently, he taught them the way to be close to Allah through invocation and contemplation of Ism-e-Allah Zaat. In other words, he did not indulge people in forty days seclusion or lengthy recitals. The aforementioned saying means a successor of Sultan Bahoo will rise under his esoteric guidance who will make his teachings common and will end falsehood by reviving the religion. To try to explain the entire esoteric and exoteric efforts of Sultan Mohammad Najib-ur-Rehman to revive the religion is an impossible task yet I will humbly try to present in a concise manner. Sultan Mohammad Najib-ur-Rehman after the death of Sultan Mohammad Asghar Ali proceeded with the mission of his beloved spiritual guide. For this he got the book ‘Haqeeqat-e-Ism-e-Allah Zaat’ published. The title of this book means in English ‘the Divine reality of the name Allah’. He distributed it free to make people aware of its marvels. Sultan Mohammad Najib-ur-Rehman is the imam (leader) of the age hence he trains and guides people according to the requirements of the age. Moreover he has used every current medium available to make the teaching of Faqr common. It is the special favour of Allah, esoteric beneficence of Sultan Mohammad Asghar Ali and the sincere intentions of Sultan Mohammad Najib-ur-Rehman that whatever task he starts becomes a successful one. On studying the book ‘Haqeeqat-e-Ism-e-Allah Zaat’ people started to enter in the circle of his slavery by manifold. Moreover, after benefitting from Ism-e-Allah Zaat’s beneficence the same people become desirous to spread the word among their groups. The special way of Faqr has been for the chosen seekers of Allah throughout the ages other than the age of al-Ghawth al-Azam Shaikh Abdul Qadir Jilani where it was for the masses. The point being simple that Sultan-ul-Faqr VI Sultan Mohammad Asghar Ali made the rule ‘to open the Divine secrets of Ism-e-Allah Zaat is forbidden’ the total opposite. Hence, many people benefitted from Ism-e-Allah Zaat. Its invocation and contemplation opened the ways to Divine vision and the Mohammadan Assembly. When Sultan Mohammad Najib-ur-Rehman acceded the throne of Divine guidance and persuasion he further eased the way of Faqr. To make the unparalleled marvels of Ism-e-Allah Zaat customary, he used every medium of technology available. All this is evident proof of inspirational knowledge of Sultan Mohammad Najib-ur-Rehman. Furthermore, no matter how much the age has progressed it is merely a dust particle in front of the perfect Fakir for whom everything is conquerable. Explanation: That person cannot be a believer who has not reached and possessed the light of Prophet Mohammad. A true believer (the Universal Divine Man/ al-Insan al-Kamil) is the one whom Allah grants authority over all the realms. Explanation: In the ever changing cosmos, the reason of change and the initiator of innovation is the Universal Divine Man. He is the pivot around whom every creation circumambulates. The steps taken by Sultan Mohammad Najib-ur-Rehman to make Ism-e-Allah Zaat customary are indeed revolutionary. Hence, no man can make an excuse on the doomsday that being lost in the comforts of the world he could not ponder on reaching the Divine Essence. If one has the intention then every medium is inviting towards the Truth. One has to set right the intentions first. Moreover, seekers of Allah needed years to reach the final stage of invocation and many a times disciples due to their impure intentions never even crossed the first stage of invocation. Sultan Mohammad Najib-ur-Rehman’s special beneficence is the fact that he grants the final stage of invocation on the first day of pledging the oath. The invocation of ‘Hoo ھُو’ is the most elevated invocation of the Mystics (Arifeen) and to bear its theophanies is impossible for a common disciple. Sultan Mohammad Najib-ur-Rehman makes even a novice seeker able to bear the theophanies of Ism-e-Allah Zaat. Therefore such seekers become capable enough for the Divine vision and the Mohammadan Assembly. Sultan Mohammad Najib-ur-Rehman follows the example set by predecessor Fakirs by travelling and distributing the beneficence of Ism-e-Allah Zaat with or without oath. He travels throughout Pakistan. He has initiated online oath system for those seekers who are either abroad or in distant cities of Pakistan and could not travel to his khanqah. This is a worth praise step initiated by Sultan Mohammad Najib-ur-Rehman and through this online oath system many seekers of Allah have benefited from the blessing of Ism-e-Allah Zaat. Sultan-ul-Ashiqeen Sultan Mohammad Najib-ur-Rehman bestows the seekers of Allah on the blessed day of Mawlid every year with Ism-e-Mohammad who have reached the secret of Ism-e-Allah Zaat and have excelled in it. This tradition will continue this year as well. With Ism-e-Allah Zaat and Ism-e-Mohammad, Sultan Mohammad Najib-ur-Rehman has blessed his sincere seekers with Waham (inward conversation with Allah) and Ilm-e-Dawat (communication with sacred souls of shrines). Previously these blessing were unveiled on few chosen seekers. Unveiling them discloses the fact that Sultan Mohammad Najib-ur-Rehman indeed is the beloved in the Mohammadan Assembly as well as of Shaikh Abdul Qadir Jilani and Sultan Bahoo. The beneficence of Sultan Mohammad Najib-ur-Rehman is for all the Mohammadan umma irrespective of their caste, creed or sect. Open invitation to all to come sincerely to Sultan Mohammad Najib-ur-Rehman and seek Allah alone to be successful in the world and the hereafter.